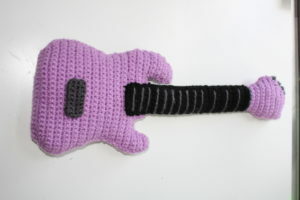 I thought I’d try my hand at making a baby sized electric guitar. Lots of trial and error went in to this, and it took about a week from start to finish with a few nights I didn’t work on it at all. There are a lot of parts to this, so while I wrote the pattern here, I’ll also go more in depth of how everything goes together at the bottom. I hope this isn’t too confusing! 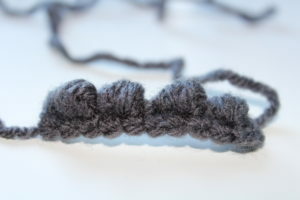 *If you are relatively new to crochet, do not use black unless you have amazing task lighting other wise you will not be able to see ANYTHING. After finishing the first and largest “fin” of the guitar, start with the fin you just made on your right side. Row 7: At this point you can weave in all ends. Using Color B, chain 8. Row 3-36: Repeat row #2 until you have a total of 36 rows. Loosely fasten off and leave a long tail. Row 3-32: Repeat row #2 until you have a total of 32 rows. Loosely fasten off and leave a long tail. 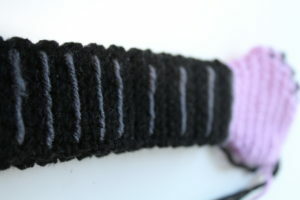 Pull out the last stitch on NECK and color change to Color A, CH 1, turn. Using Color C, CH 11. 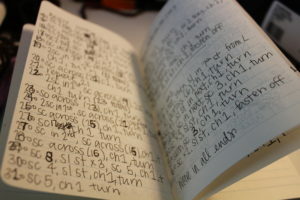 Using Color C, chain 9. Okay, so here’s the tough part. Before sewing the stuffing in, you’ll want to add the details first. 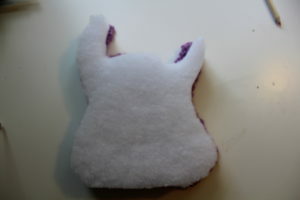 I got excited that it was looking like a guitar and did the stuffing first – bad idea. It’s so much easier doing details with access to both sides of the piece. 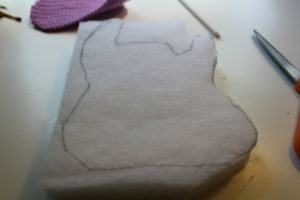 Let’s start with the guitar body. 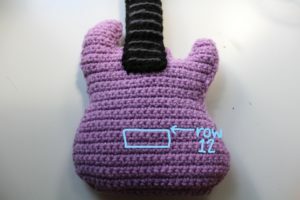 If you’re making a “righty” guitar the taller “fin” should be on the left side, if you want it to be a “lefty” put the taller fin on the right. Once you pick, you can then sew on the bridge. You’ll want to sew the bridge to the body using the tail you left with bridge. The top of the bridge should line up with row #12 of the body. Then you can set the body pieces aside and we’ll come back to them later. The tallest part of the head should be on the right if making a “righty” guitar. 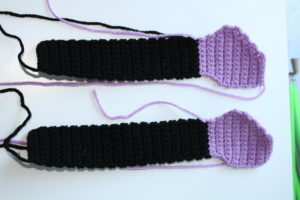 On the longer head/neck piece, weave the tail from the right side to the diagonal. 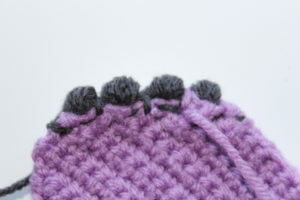 You’ll want to sew in the tuners to the diagonal line of the head using the tail you just brought over. Sew over the SL ST in between the puff stitches so only the puff stitches are showing – this will create the look of the tuners. Once you’ve finished with the tuners, on that same head/neck piece, you’re going to back stitch the frets. 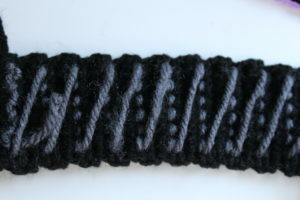 I did the back stitch backwards, so that the wrong side is on the outside. It makes it look smoother. Your first line will be where Color B for the neck and Color C for the head meet. You’ll do 4 more lines of back stitching each time skipping 4 rows. After that, you’ll do 9 more back stitching lines every 2 rows. The back of neck should look like this. Now for the fun part! Stuffing! Lay out your piece of NuFoam and lay one body piece and one head/neck piece down. Trace with a marker and cut them out. I found it was easier to cut the foam half way then go back and cut the rest. It looks kind of like this. If you do try to cut through the entire piece of foam, be careful, I somehow ended up with a blood blister on the top of my thumb from cutting. 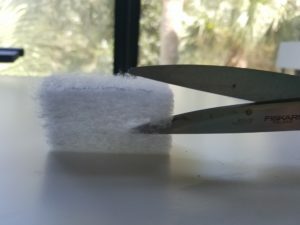 Once you cut them out, you will want to cut off about 1/4″ all the way around the foam piece, otherwise it’ll be really tough to get it in there. 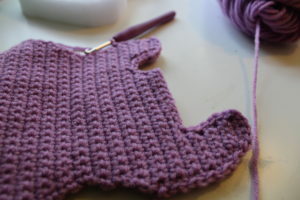 I started with sewing together the body at around row #22. This allowed me to get the fins sewn together before putting the stuffing in since those would be the hardest. If you need help stuffing the stuffing in, I used the back of my hook to push it into the corners. 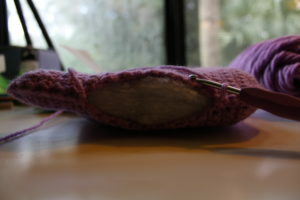 After the stuffing is in place in the fins, you can continue sewing around. Make sure to tie off securely and weave in the ends. 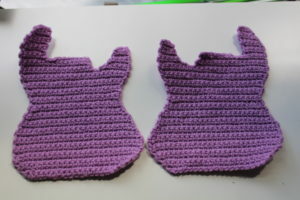 Next, sew the heads together – make sure that only the “tuners” are poking out. 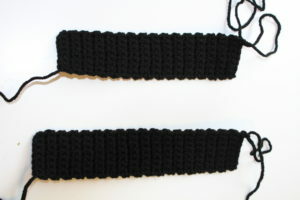 Switch to Color B and sew down one side of the neck, stopping before the last row of the shortest side. Insert the stuffing (again using the back of the hook if needed) and sew down the other side using the other tail of Color B. Again, you need to stop before the last row of the shortest side. Now to finish it up, you’ll want to sew the neck to the body. You may need to add a little bit more stuffing to the join. Make sure that the neck extends down the front of the body, and a little bit on the back (that’s why you stopped short on the back).